The MRS modular rack system provides a platform for Renishaw probe and stylus changing racks. 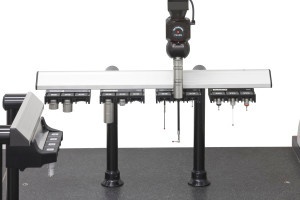 It consists of a rail (400 mm, 600 mm or 1000 mm long) that holds the probe or stylus changers, and interconnecting legs of selectable lengths that allow clearance for long styli and extension bars. The rail is compatible with the SCP600 and SCP80 (stylus change ports for SP600 and SP80 respectively), the ACR3 (autochange rack) and the FCR25 (stylus and module change rack for the SP25M). The ACR3 provides a passive means to automatically exchange probes without the need for re-qualification. ACR3 uses Renishaw’s unique autojoint connector to attach probes and extensions to the PH10M PLUS andPH10MQ PLUS motorised indexing heads. 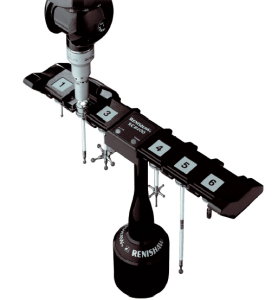 It can support a range of sensors from Renishaw and other metrology suppliers. 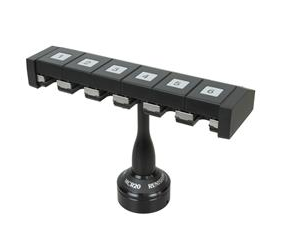 Although the ACR3 is a four port unit, two can be linked together so that eight different probes or extensions can be stored in the rack – sufficient for any measurement task. A passive mechanism locks and unlocks the autojoint for secure and fully automatic sensor changes. The motion of the CMM is used to drive the change process, meaning that no additional motors or control are required. 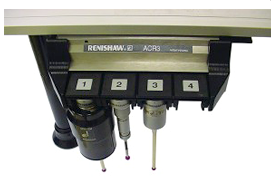 The ACR3 is part of Renishaw’s MRS modular rack system, meaning that an ACR3 unit can be combined with an FCR25 module change rack for SP25M scanning probe, or with SCP600 stylus change ports for the SP600M scanning probe. The full potential of the SP25M system may be realized when the flexible change rack option is incorporated. The FCR25-L6 Change Rack includes two FCR25 triple-port rack units, which allows any of the SP25M system elements to be rapidly exchanged in any of the ports. This is undoubtedly the most adaptable rack system ever from Renishaw. The FCR25 units mount directly to Renishaw’s MRS modular rack system. 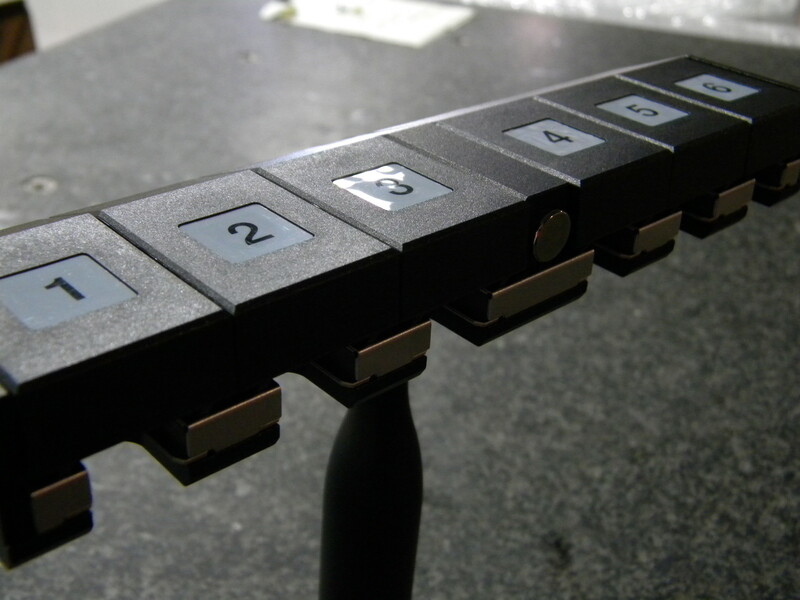 A module change rack that enables automated changing of TP20 stylus modules. The MCR20 module changing rack is passive and can store up to six TP20 probe modules for automatic changing under measurement program control. MCR20 is designed to securely hold the stored probe modules for automatic changing and to protect them from airborne contaminants. 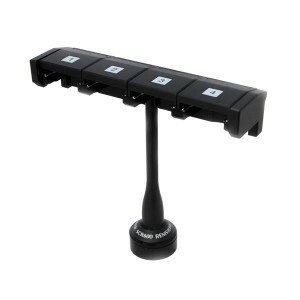 A change rack for TP200 stylus modules. The SCR200 provides automatic, high speed changing between up to six TP200 stylus modules and is powered by the separate probe interface PI 200-3, providing features to facilitate safe stylus changing. A change rack for SP600 stylus modules. 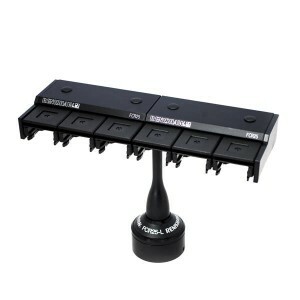 The SCR600 is a passive stylus change rack and so it requires no electrical connections. It is protected from overtravel (in the probe entry direction) by a mechanism in the base which can be manually reset. The SCR600 houses up to four SP600 stylus modules per rack and any number of racks can be used in a system.